Homework is a hot-button topic! To give homework or not to give? How much homework is too much or too little? Parent assistance or no parent assistance? To correct or not to correct? Post homework on-line or give only hard copies? Today I'm linking up with Christina at Bunting, Books, and Bright Ideas to share why I do what I do with weekly homework. To instill the love of reading is a BIG priority for me, so we require 20-30 minutes of reading per night. I used to have students keep a daily reading log and parents signed off. However, some of my most voracious readers would not have their logs at the end of the week because they were so into their books, they did not take the time to write it down. Or many complained that they read in bed before going to sleep and they didn’t want to get out of bed again to record. I totally understand that!! So I reflected on my purpose for nightly reading and realized it was to encourage a reading habit (and as an adult, I would resent having to write down everything!!). So now it’s on the honor system and we do plenty of discussing and sharing books we are reading! We do require a monthly book report to expose students to various genres. Now that I finished reading Notice and Note, I’m thinking of revising the book reports to include the signposts!! 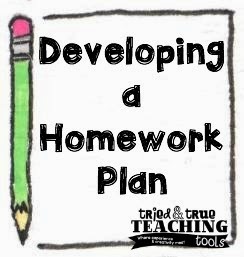 To make my planning simple and predictable and to ensure consistency for my students & families, my teaching partner and I use a weekly homework schedule. 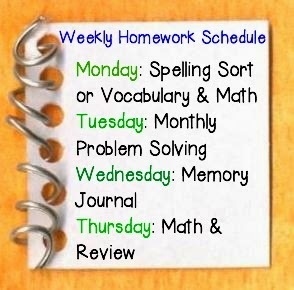 The question of whether or not to post homework assignments on our class websites: we USED to post weekly homework, but over time we became dissatisfied because although it made it easier for parents to access, students felt no responsibility to accurately record their homework or to keep track of it. With bated breath, my partner and I wrote a letter to our 4th grade parents, explaining our reason for no longer posting homework. We were shocked and surprised to find that 99% of our families agreed with our reasoning and they were in full support of holding their children accountable. Students have also made good use of “Study Buddies” to call or text when they need homework assignments! 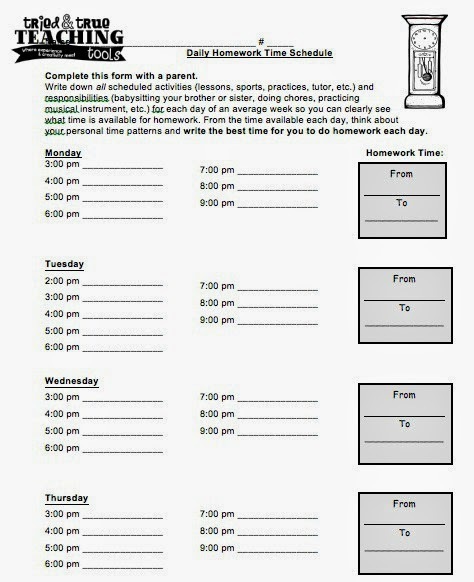 Assign purposeful homework. Legitimate purposes for homework include introducing new content, practicing a skill or process that students can do independently but not fluently, elaborating on information that has been addressed in class to deepen students' knowledge, and providing opportunities for students to explore topics of their own interest. 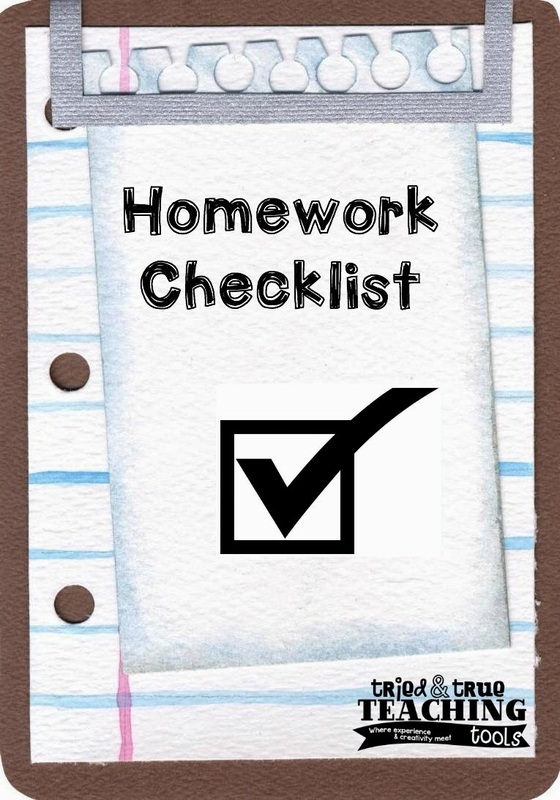 Carefully monitor the amount of homework assigned so that it is appropriate to students' age levels and does not take too much time away from other home activities. Our students keep a plastic 2-pocket folder with 3 brads/paper fasteners. Sometimes we’ve had them keep a 3-ring binder, but there’s really nowhere to store them during the day so they ended up on the floor. The folders can fit into student desks. In the paper fasteners, student put necessary forms such as: Weekly Schedule, Survival Kit list, a blank calendar (to be filled in with due dates of projects, tests, and steps of long-term projects), and a student accountability checklist. Click here for your free copy of forms we use, including our parent letter! What is your homework schedule or policy? How do you make homework meaningful? I'd love to hear from you!